Back in March, Google announced the acquisition of online photo editing software maker Picnik. It was a solid play for Google–while Google’s Picasa competes with the more-established Flickr, what better way to even the playing ground than to snag Flickr’s own editing software out from under it? 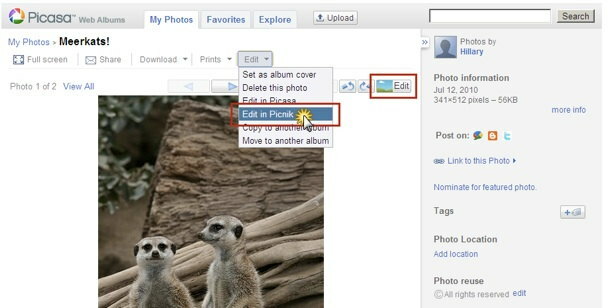 Picasa’s Web editing launched today. Before, there were basic photo editing tools available to users through Picasa’s PC application–you could crop, resize, add some simple effects, that kind of thing–but Web users were left in the dark. Adding these features to the Web software is especially important as more and more work is done remotely from the cloud; you shouldn’t have to be at your own computer to do this kind of low-level photo editing, right? Picnik gives those basic features, while interestingly retaining its own particular look. It’s not integrated into Picasa so much as it’s crammed in, more like Picasa now gives you the option to use a third-party service than introducing a new feature. It even retains the same pricing structure: free for the most basic tools, and $5 per month (or $25 per year) for some more advanced tools and options. It’d be nice if the whole thing was free, but that’d be changing Picnik entirely, which maybe Picnik itself would rather not do. Anyway, you can check out the new Picasa by clicking on the “Edit in Picnik” button under the edit menu.